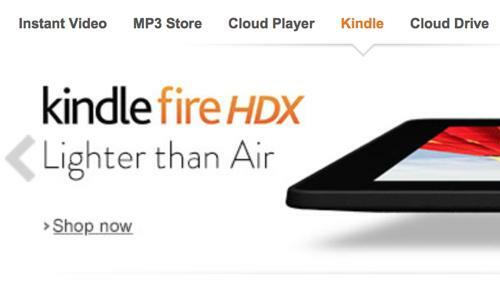 In response to Apple's new iPads, Amazon took a direct shot at its competitor on the front page of its website Wednesday, saying the Kindle Fire HDX is "lighter than Air"— even though the new Kindle achieves that weight with a smaller display. The advertisement is a not-so-subtle jab at Apple's new iPad Air, which shaves nearly a half-pound off the weight of its predecessor to drop to just one pound. While the Kindle Fire HDX weighs in at 0.82 pounds for the $379 Wi-Fi-only model, it achieves that weight with a screen size of just 8.9 inches. Apple's iPad Air, in contrast, has a larger 9.7-inch Retina display with more screen real estate. Both devices are also unsurprisingly heavier than Apple's new iPad mini with Retina display, which sports a 7.9-inch screen. Apple's smallest tablet weighs 0.73 pounds in its Wi-Fi-only variety. Amazon also offers a 7-inch version of its Kindle Fire HDX tablet. It too edges the Retina iPad mini in weight, at just 0.66 pounds, but also sports a screen size nearly a full inch smaller diagonally in the process.